When your world is limited mainly to your hospital room and the floor it's located on, it can feel like the walls are closing in on you. And if you've been staring suspiciously at those walls for 119 days and counting, waiting for a heart and liver transplant, it's not easy to stay positive. Stephanie Lienenbrugger found herself in that very place. She was getting the medical attention she needed. But the nurses caring for her physical health wanted to make sure her emotional health received attention, too. About two years ago, Lienenbrugger, born with a congenital heart defect, was diagnosed with hepatocellular carcinoma, and transplant was the recommended course of action. For the first 18 months, she waited for a heart and liver transplant at her home outside of Austin, Texas. She had a detailed plan that would get her to Mayo in time, should donor organs become available. But her name was not moving up the transplant priority list. Back in July, her care team recommended that she be admitted to Saint Marys until the transplant could take place. And the waiting continued. 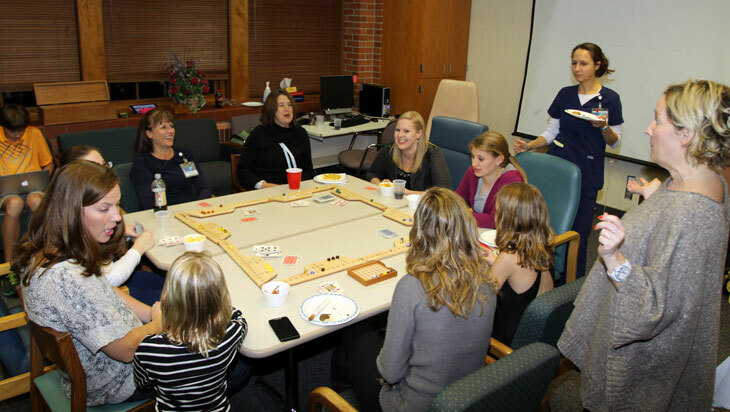 In October, three of the nurses caring for Lienenbrugger, Katie Benike, Tiffany Schoenfelder and Jaclyn Hackey, went to Kim Poe, Domitilla 4 nurse manager, and said they'd like to pull together a game night for Stephanie and her family to raise her spirits and distract her from the waiting. After getting permission and doing a bit of scheming, a plan was in place to turn an ordinary conference room into Game Night Central. That night, 10 to 15 off-duty nurses surprised Lienenbrugger. They showed up with games, and a potluck of snacks and beverages. Her husband and children, who relocated to Rochester from Texas for the waiting period, were part of the surprise. "I was under the impression that the kids were too busy with homework that night," Lienenbrugger says. But there they were. Lots of visiting and game playing ensued. Like one big, happy family. "I was really moved by the fact that the nurse were willing to come in on their day off or stay after their shift to help boost my spirits," says Lienenbrugger. "They are a great group of folks. I've become very attached to them, and they are extremely protective of me ... They're like family to me." She also noted, "I would consider every one of them a friend if I walked outside this door and just met them on the street." Which is good because (great news), she'll be able to do just that very soon. After we visited with Lienenbrugger (see the video below), she received her heart and liver transplant. She is doing well and will be discharged soon. Kim Poe tells us she came back to her old hospital stomping grounds for a visit the other day, and "everyone was so happy to see her!" Like a big old family reunion. Move up our list by sharing your comments below.